Pain, joint stiffness, decreased muscle performance. Decreased aerobic capacity affect the quality of life and increase the risk of disability for the individual with osteoarthritis. Therapeutic exercise and manual therapy interventions are important in the comprehensive management of osteoarthritis. There are some principles for osteoarthritis management. Which are as follow. 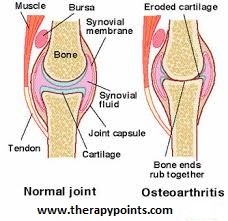 Education includes teaching the patient about the disease of osteoarthritis, how to protect the joints while remaining active and how to manage the symptoms instruct the patient in a home program of safe exercises to improve muscle performance ROM and endurance. Early stages pain and feelings of stiffness are common complaints during the early stages. Pain usually occurs because of excessive activity and stress on the involved joint and is relieved with rest. Brief periods of stiffness occur in the morning or after periods of inactivity. This is due to gelling of the involved joints after periods of inactivity Movement relieves the stasis and feelings of stiffness. Help the patient find a balance between activity and rest and correct biomechanical stresses in order to prevent retard or correct the mechanical limitations. Late stages. During the late stages of the disease, pain is often present at rest. The pain is probably from secondary involvement of subchondral bone, synovium, and the joint capsule. In the spine, if bony growth encroaches on the nerve root, there may be radicular pain. Emphasize modification and use of assistive devices or splints to minimize joint stress. Pain that cannot be managed with activity modification and analgesics is usually an indication for surgical intervention. With the progression of the disease, the bony remodeling swelling and contractures alter the transmission of forces through the joint, which further perpetuates the deforming forces and creates a joint deformity. Functional activities become more difficult. Adaptive or assistive devices, such as a raised toilet seat, cane, or walker may be needed to decrease painful stresses and maintain function. Shock absorbing footwear may decrease the stresses in osteoarthritis of the knees. Aquatic therapy and group-based exercise in water decreases pain and improves physical function in patients with lower extremity osteoarthritis. Non-impact or low impact aerobic exercise.